I stumbled upon the idea of ‘green monster’ smoothies entirely by accident, while trying to research smoothie recipes to incorporate the giant carton of spinach I buy weekly. Now, this one is not super high in protein, so it may not leave you full, however, when I was drinking this once a day for about a week, my skin was practically radiating with thankfulness. I just have a wee Magic Bullet one shot, so feel free to double the recipe if you’ve got an appliance that can handle it. 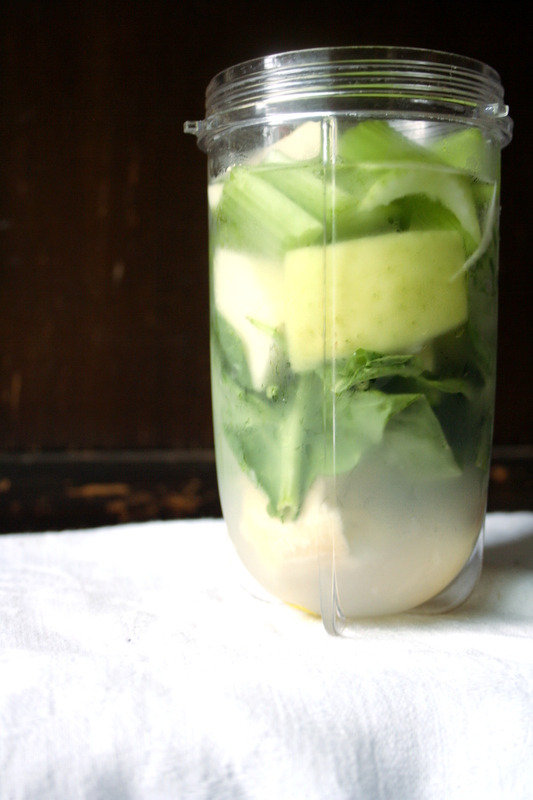 Drink it for a week and watch your skin glow! I usually fill my blender with the lemon juice and food first, and see how much space is left for water to pour in. Then I simply blend, drink, and walk around with a look of extreme smugness for the rest of the day. Followed by amazing skin, of course. Enjoy! Awesome, let me know how it goes! I seriously make it nearly every day, and it’s always a great way to start my day. I think I will definitely try this! This smoothie and an egg would be a great breakfast! The egg would be a great idea. I honestly thought it wouldn’t taste that great, but it was surprisingly refreshing. Enjoy and let me know how it turns out!